This card uses one of my all time favorite stamp sets when I want something elegant. Stampin Up's Elegant Greetings (retired set) which has a stamp for wedding, birthday, thank you and thinking of you AND the sentiments to put inside the card. It truly makes a very nice card. I used a basic white card base. 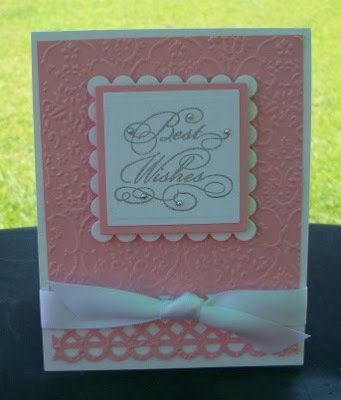 A Pretty in Pink embossed piece was punched using an MS border punch and placed on the base. A piece of white cardstock was cut out with square Nestabilities and embossed. Then the main image was silver embossed with the "Best Wishes" stamp and tiny silver rhinestone stickers were added in different places on the sentiment. A slightly larger Pretty in Pink square was die cut as well as an even larger scalloped square. The main image was adhered to the PIP piece then raised on foam adhesive and placed on the white scalloped piece. This piece was raised with foam adhesive and placed on the background panel. A piece of white satin ribbon was wrapped around the card and knotted in the front. The inside accompanying sentiment was silver embossed...it reads "May happiness be yours today and always." A string of 5 silver rhinestones were placed underneath this. I hope my new little bride will like it. She's so very sweet!! Other: Silver Detail EP, White Satin Ribbon, MS border punch, Silver Rhinestone Stickers, Textile EF, Square and Scalloped Square Nestabilities.